For many people, other than their houses and cars, their watches are one of their most valuable possessions. Because of this, travel watch boxes are important accessories. These small cases are designed to keep watches safe and free of damage while traveling. They are small enough to fit into carry-on luggage, but large enough to hold several watches. 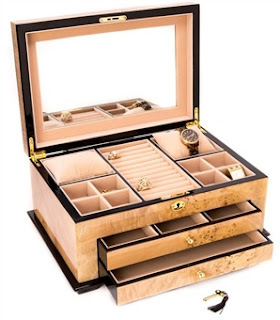 At Chasing Treasure, we are dedicated to curating a collection of jewelry boxes that are designed for all jewelry needs - even something as specific as a small collection of watches. 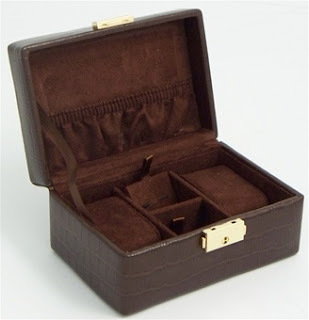 Our travel watch boxes have spaces for traditional wristwatches and for the classic pocket watches. Some of the watch boxes are just for wristwatches. Most of these hold four watches on removable watch pillows that are made of protective suede. The cases themselves are usually made leather or other high-quality textiles. The travel cases often have locks or snap closures to keep the watches inside. We also have travel watch boxes that can hold other small jewelry items. For men or women who travel with one or two timepieces, we have boxes that have spaces for cufflinks and earrings. Some of the jewelry boxes also have small ring rolls, too. Nearly all of the compartments are removable, so the jewelry travel cases can be customized for each trip. Our attractive and convenient travel watch boxes are affordably priced, too. They come in a few different price points, so you can find the one that works the best for your budget. Despite the affordability, all of the pieces are high-quality - just like our keepsake and heirloom quality jewelry boxes and armoires. We take great pride in curating collections with the best products available on the market today. And, since these pieces are designed for travel, they are durable, too. Most of the travel watch boxes have extra features that make them useful. Since they all have lids that secure, many of the boxes have features attached to the inside of the lids. Some have pouches that can hold papers or other small necessities. Some have money clips so you can keep extra cash or traveler’s checks in safe places. It is always a good idea to keep money in a variety of places in case anything happens while on the road. These small travel watch boxes are the ideal size to put into hotel room safes. If the safes are too small, they will fit in the hotel safes, too. All of the travel watch boxes are designed to be neutral in their design. They are perfect pieces for both men and women. They come in neutral colors like black and brown. The interior colors are also neutral colors like light blue, gray, and brown, too. Anyone travels on a regular basis would be happy to use these to protect their jewelry and to keep everything together in one convenient location. All of the pieces in our curated travel watch collection also come with the 30-day return policy and our Chasing Treasure one-year warranty, too. Buying jewelry always comes with a risk, especially if you decide to buy pieces secondhand or from places other than respected jewelry stores. The biggest risk involves whether or not the precious metals like gold and silver are actually real. Fortunately, there are several ways to determine if the metals are real or fake and many of these tests can be done without the need of a loupe or any chemicals. Before learning how to tell whether gold is real, it is important to know what is “real” gold. In the US, the magic number for gold is 10 karats. If the gold wears that monicker, it is not consider “real” gold because it contains too many other types of metals. If you are shopping for gold jewelry at an auction or another second-hand shop, you should bring a magnet with you. Gold is not magnetic, so if the piece you are considering is attracted to your magnet, then you immediately know that the piece is not real. Unfortunately, using a magnet will not guarantee that the piece is gold because there are other metals that are not attracted to magnets. If you are considering a gold chain of any type, there are a few industry standards to consider. Real gold chains will have stamps on both clasp tabs. The stamps will say 14K or another number larger than that. Also on the clasp, the O-ring that attaches will be soldered to the chain. Pieces that are not gold will not be soldered simply because the soldering process is too hot and will actually melt the chain. Fake chains will look more like brass and you might even be able to scrape off paint or a plastic coating. Fake gold rings are also easy to spot - especially in the secondhand market. Real gold rings will have clear markings on the inside. You will be able to see 14K and other markings that show the manufacturer. Fake rings will look worn and they will have markings like GF, which stands for gold filled, or marking that start with H, like HGP and HGE - heavy gold plate or electroplate. These are not real gold. Fake gold bracelets, especially if they are chains, will have the same issues that the necklaces have. But, bangles will have the same issues that fake gold rings have. Often, used pieces will have signs of wear that show a base metal coming through. Real gold will be consistent in color and sheen. Many fake gold bangles will have the same markings as rings, like HGP or HGE. They will also have fractions to show how much gold fill they contain. So you might see something like ¼ GF. Finally, the easiest fake gold jewelry to spot is earrings. These are easy because the post will not be made of gold. The colors of the gold earring and post will not match on fake pieces. Real gold earrings will be gold from the post to the decorative piece. When it comes to storing your jewelry, even your most precious diamond rings need to be stored properly. Believe it or not, your diamond jewelry can become damaged just as quickly as the other pieces in your collection. Since diamonds are usually the most valuable pieces in any collection, they should be treated as such. If you neglect your diamond jewelry, there is a chance that the stones, along with the metals that hold them can become scratched and possibly even chipped. Despite the fact that diamonds are touted as one of the hardest materials on the planet, they can become damaged. To prevent this, your diamond jewelry should have its very own special place in your jewelry box. If you only have a diamond engagement ring, then you should be sure that it has its own special place away from the other pieces of jewelry you have. The space where you keep your diamonds should be free of moisture and far from chemicals that could create problems, too. If you wear your diamonds on a daily basis, then you will want to still keep them in individual spots, but in places that you can quickly access. If you want to keep your diamond jewelry looking pristine, you should keep each piece away from every other piece that contains diamonds. The easiest way to damage a diamond is with another diamond. So, they should never be kept together. Each piece of diamond jewelry needs its own special location in your jewelry box or in your table top case. In order to keep your diamond ring looking lovely for a lifetime, it is a good idea to take it off when you undertake messy tasks. If you are gardening, washing dishes, or lifting heavy items, you should not wear your diamond ring. The stone could catch on something or you could lose it. You might even damage it with the heavy object your are lifting. It is always a good idea to take off your diamonds when you are bathing, showering, or swimming because of the chemicals in the water. 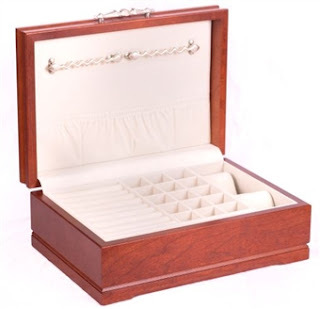 At Chasing Treasure, we have a wide variety of jewelry boxes that come with separate compartments as well as ring rolls that are designed to keep small jewelry items like diamond rings safe from harm. Our jewelry boxes are heirloom quality, making them perfect for storing your most precious and valuable pieces. Men who own attractive and luxurious watches need to be able to store then in safe locations. For many men, their investment timepieces are the most valuable jewelry they have besides their wedding bands. In order to keep the watches in pristine condition, it is vital to keep them stored properly. If they are left laying about on tables or countertops, they can be quickly damaged from excessive dirt and grime or even from accidental water damage. At Chasing Treasure, we offer a wide variety of beautiful, handmade, heirloom quality jewelry boxes designed to protect watches. But, a high quality jewelry box is not always enough for valuable watches. While storing watches, it is important to keep the timepieces apart from other jewelry. When items are stored next to each other, they can become damaged by rubbing together. Even stainless steel timepieces can be damaged. If you still have the original boxes that the watches came in, those are ideal to use for safe storage. The small pieces inside of watches require users to take good care of them. Otherwise, it is best to put your valuable watches in separate compartments or on watch rolls. Another useful way to store watches is on a winder. There are several automatic watch winders that are available for different types of watches. Many of the newest watches automatically wind while through the movement of the body. So, as the body moves, the tiny pieces inside of the watch keep the watch on time. There are cases that will keep watches winding automatically, as if you were wearing them. These automatic watch winders can be put inside of watch cases to keep them ticking on time. Fortunately, many of the best watch winders can be added to display cases so they look great while they are being wound. If you have an extremely valuable collection of watches, it can be helpful to store them in a locked safe. Many of our smaller jewelry boxes can fit securely inside of a small safe. Some of the watch cases can also be locked. While this is no substitute for a real, secure safe, a locked jewelry box can provide some respite from hands that might be curious enough to look into a jewelry box. If you do decide to store watches in your safe, you might also want to investigate the best way to insure your valuable property. At Chasing Treasure, we take pride in offering a wide variety of extremely safe jewelry boxes designed just for valuable men’s watches. We understand that many men have watches that have been passed down through the generations and that they have become family heirlooms. 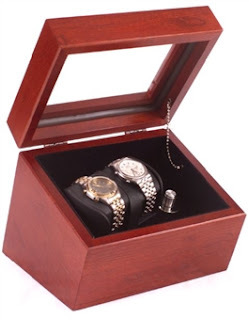 While you might be tempted to store your valuable watches in cigar boxes or other make-shift jewelry boxes, our boxes are designed especially for jewelry. On the inside, they have tarnish-resistant cloth and the exterior hardwoods are constructed to last. You can trust that our quality jewelry boxes are the best options for maintaining the integrity of your favorite time pieces. 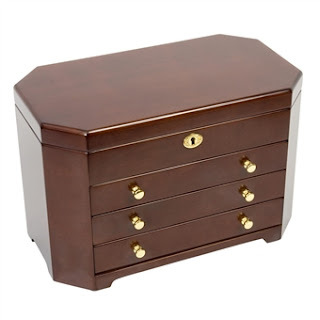 At Chasing Treasure, we offer a variety of jewelry boxes and keepsake boxes in several different wood finishes. Some of the wood finishes will sound familiar, like mahogany, cherry, maple, and oak. But there are other finishes that many people may never have heard of, like burlwood and bubinga. We also offer jewelry boxes in painted finishes like white, black, and espresso. Because each finish and wood grain offers different features, we thought we would take a look at what makes each one unique. One of the most popular finishes at Chasing Treasure is the cherry finish. This beautiful finish has subtle yet rich red undertones. Cherry is a hardwood that comes from a sustainable tree that grows quickly. Cherry looks fabulous with silver- and gold-tone hardware. It is a good option to give as a gift because it coordinates with a variety of decors. Mahogany is another popular option. This is a unique choice because the genuine wood actually gets darker as it ages. It is smooth and sleek and looks amazing with silver-tone hardware. It is a beautiful choice for gift-giving because it exudes elegance and luxury. Like cherry, it does have a slight red hue to it. The mahogany used for our luxury jewelry boxes comes from new-growth farms. People who love modern decor enjoy the lines and irregularities of walnut. The grain adds a style that is unique and rich. Walnut is deep brown and can be styled with both gold- and silver-tone hardware. Even though the wood is usually stained in a dark color, we do offer some with light stain. Both show off the personality of the wood. Walnut is a wood that is extremely durable and the trees are not in any danger of becoming threatened. If you are looking for something more traditional, we offer oak and maple jewelry boxes. Our oak boxes have the warm tones that the wood is known for. Since oak is a softer wood, it is important to take good care of the jewelry box. Our maple boxes are also good sellers - especially those made of bird’s eye maple because of the unique spots that appear in the grain. Maple boxes come in a lighter finish the oak boxes. Both are from tree farms that use sustainable practices. When it comes to unique options, burlwood and bubinga are perfect choices. Burlwood can come from any tree that develops a burl - or an unusual growth. The burls have whorls, grains, and textures that are different from the traditional rings of tree trunks. The bubinga tree is found in West Africa and can grow trunks that are over eight-feet in diameter. This tree is prized for its unique grains. This wood is often used for musical instruments, so using it for special jewelry boxes makes them into keepsakes. Along with the exotic, but sustainable wood options, our painted boxes are made of hardwoods have been finished in a silky, smooth way. Some of the boxes are finished in a flawless matte style, while others have traditional glossy finishes. They are durable and look amazing in any decor. Caring for jewelry needs to be a priority for anyone who owns any precious stones and metals. Jewelry pieces are investments and to keep them in good condition, they need to cared for when they are not being worn. Our jewelry boxes are perfect choices for holding diamond rings and other value pieces. If you do own a diamond ring, there are a few things you can do to keep the ring in top shape. Taking good care of your favorite pieces of jewelry will make them last for generations. Despite the marketing claims that say diamonds are forever, they are not indestructible. They are the hard substance on the planet, but they be damaged. It is possible to chip or crack a diamond. When precious diamonds are properly stored in a dry jewelry box, they are more likely to last. It is the harsh conditions in the environment that can cause the most damage. The best way to store a diamond is away from other diamonds. Since they are equally hard substances, they can damage each other. Some people will have separate boxes for each piece of diamond jewelry they own. At Chasing Treasures, we have small trinket boxes that can be used as individual boxes for individual rings. It is also possible to store individual rings in separate drawers in a larger box. They can also be stored in the separate compartments in jewelry box trays. Proper storage is a great way to keep rings in like-new shape. When and how you wear your ring can make a difference in the longevity of the piece, too. There is nothing wrong with taking off a ring before you do any type of dirty work or heavy work that could damage the metal or the stone. Not wearing your ring in the shower, tub, or while doing dishes will help extend the life. It is also a good idea to take it off any time that you will be working with chemicals, even if you wear protective gloves. If you are storing your rings for an extended period of time, it is helpful to clean them first. But, you should always clean with the appropriate cleaners. While diamonds do not react to chemicals, the metal setting might react negatively. If the cleaner contains chlorine, troubles can occur. This could result in the weakening of the setting, which could cause the diamond to fall out and get lost. If your diamond ring also has other types of stone in it, the cleaner you use on your diamond could shatter the other stones. It is best to take rings with mixed stones to a jeweler for cleaning. We understand the importance of properly storing your treasures and heirlooms, which is why we have created a complete lineup of jewelry boxes, armoires, and trinket boxes. If you have any questions about any of our products, contact us at Chasing Treasure at cs@chasingtreasure.com or 1-888-804-2542.